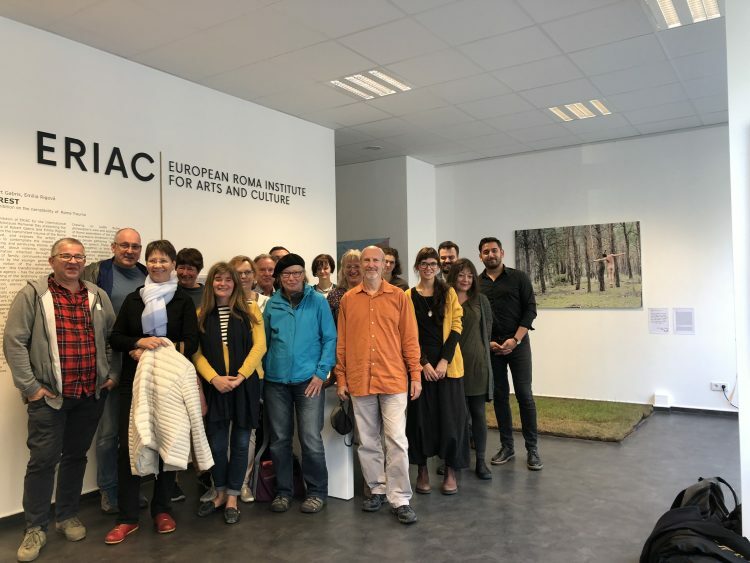 In the framework of a seminar entitled, “Bilder von Sinti und Roma gegen den Strich gebürstet” (´Images of Sinti and Roma against the grain´), a group from the organization Arbeit und Leben visited ERIAC on 9 October. During a four-day seminar, the twenty participants visited a variety of institutions and stakeholders that work within the Roma context in Berlin. After a tour of the current ERIAC exhibition, a Q&A on the situation of Roma culture in Europe took place. Wuppertal based “Arbeit und Leben” was founded in 1948 as an andragogic institution by Deutscher Gewerkschaftsbund – DGB, the German Unions´ umbrella organisation, and the Volkshochschulen (adult education centers). It is supported by the Federal Agency for Civic Education (BpB) and reaches around 300,000 participants every year. The aim of the initiative is the development of participatory democratic culture and a view on work based on social justice, equality of opportunities, and solidarity.